Thursday, September 15, 1983—28° to 38°, some snow. Skinned the moose Blake got, went to Anchorage, visited Connie and Andy until time to pick up Sylvia at the airport (Sylvia her sister Frances, Nadia and Darrell have just returned from three weeks visiting relatives overseas). Got home at 4:00 a.m.
Thursday, September 22, 1983—cloudy and rain, got to Delta one hour before daylight. Napped one hour, ate breakfast, went to Scott and Barney Hollembeck farm. Good hunting! I shot four crane, Scott and Darrel each got one. Slept in Delta. We heard that Bob Abel shot and killed Jack (don’t know his last name). Jack was Bob’s best friend and he had a 5- year-old son. Sunday, October 16, 1983—cloudy, 15° to 20°. Got gear and truck ready to go buffalo hunting. Tried to saw stove wood, bar on saw failed. Monday, October 17, 1983—cloudy, 20°. Darrel and I went to Delta and checked in with Fish and Game and started getting permission from farmers to hunt buffalo. Stayed at Cherokee II. The buffalo tramp down and eat the farmers’ grain crops. Tuesday, October 18, 1983—hunted all day and got permission from more farmers to hunt on their land. Staying at the Silver Fox with Dan and Slick. Al has brought his wife Wendy and two boys from Pennsylvania to live here. Met lots of new people. Didn’t see any bison. Wednesday, October 19, 1983—still snowing here, 0° to 20°. Later it cleared up. We each shot a crane. Darrell probably would’ve gotten another one but his firing pin broke. Got a nice bull bison after a long exciting chase. It was -10° below zero and dark while we dressed it out. Back to the Silver Fox at 2:00 a.m.
Thursday, October 20, 1983—gave some bison meat to friends here. Checked out with Fish and Game, got home after dark. Had a supper of buffalo hump. Friday, October 21, 1983—partly cloudy, warm, 30°. Friends came to see bison and take pictures. Hung meat in Schmidt’s basement and had supper there. Saturday, October 22, 1983—partly cloudy, 15° to 25°. Darrel and I took the buffalo cape and hide to get it tanned. Dan came and invited us to their place in the evening. Jim Odden’s folks are visiting from Wisconsin. 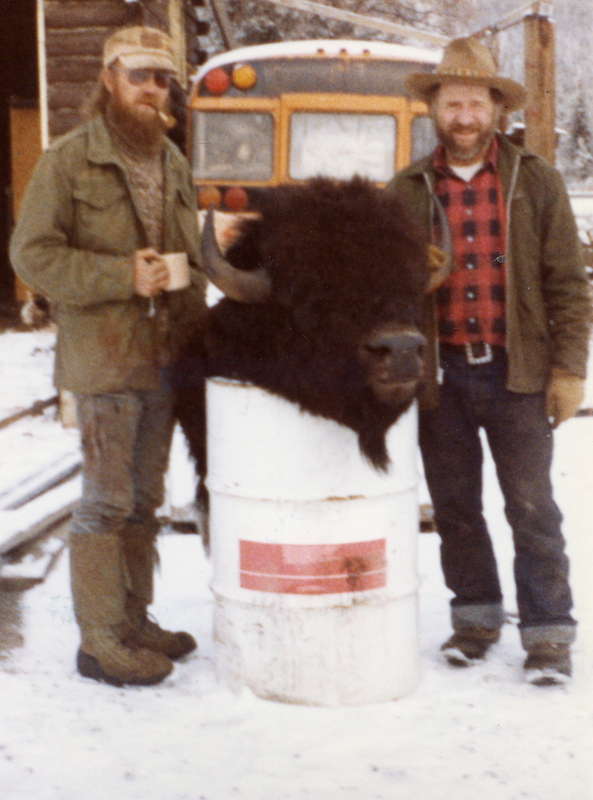 This entry was posted in Journal Entry and tagged bison, buffalo hunt, Delta, Nelchina. Bookmark the permalink.